Nobres’ plant replaced about 24 % of fossil fuels with biomass, reducing CO2 emissions. Our Nobres’ unit is in the region with the largest volume of grains production in Brazil. Taking advantage of this differential, the plant uses biomass as alternative fuel as a substitute for petcoke, which reduces the emission of greenhouse gases generated by fossil fuels. The biomass used is generated by the timber, agricultural and sugarcane industry. 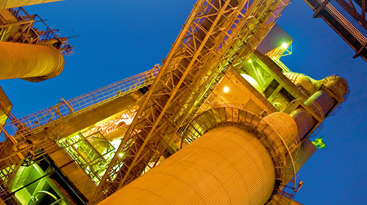 Through this practice, Nobres can achieve low levels of specific CO2 emissions per ton of cement produced , which is a major challenge for the cement industry. In the last three years , biomass has replaced 24 % of the volume of fossil fuels. In 2013 , emissions of carbon in Nobres were reduced​, reaching one of the largest thermal substitution of fossil fuels with energy use of biomass in Brazil. The use of biomass in cement production has been an important and innovative instrument adopted globally by cement producers to reduce Greenhouse Gas emissions, costs and dependence on fossil fuels. Nobres cement unit is in line with our values and sustainable practices in an incessant search for the best results and performance. Main Goals: replace fossil fuels with biomass, so as to reduce the emission of CO2 in the atmosphere. Generated Benefits: replacing fossil fuels with biomass, reducing the emission of CO2.